The success of the San Domenico School 1:1 iPad program depends on a variety of components. Professional development and curriculum design provide important support for our teachers in the task of integrating technology in learning at San Domenico. Our technology leadership plays an important role in this process. The leadership team includes a technology facilitator in each school level. Ryan Hopper (primary school), Kali Baird (middle school), and Dr. Doris Brown (high school) are our technology facilitators. These teachers consult with their colleagues helping them build technology rich lesson plans. You might wonder who trains the trainers? This week we sent them to their own professional development program at the Computer Using Educators (CUE) conference in Palm Springs. 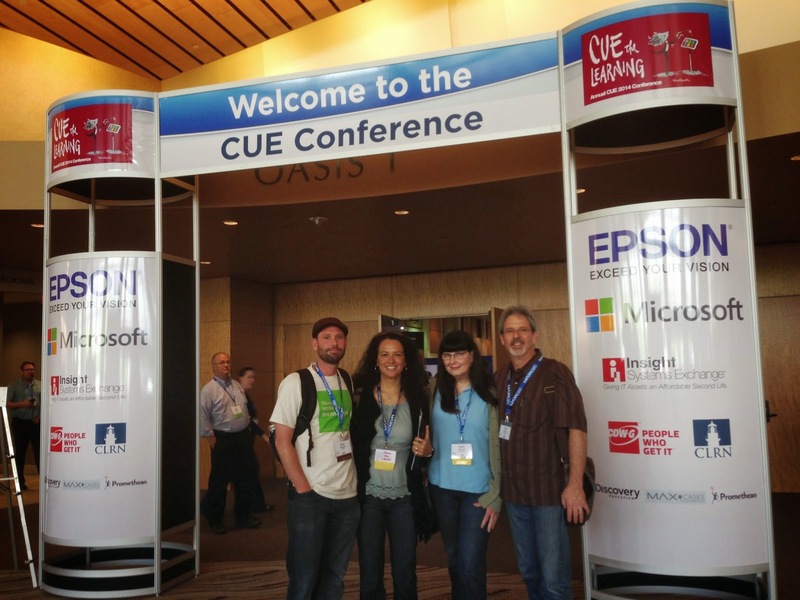 CUE 2014 provided a wealth of opportunities for any teacher looking to build a repertoire of classroom activities and lesson plans for integrating technology in the classroom. CUE had everything from Augmented Reality to Google tool SLAMs. Some sessions showcased software tools while others provided interactive discussions of best practices for technology integration. One of my favorite sessions at CUE 2014 was presented by Scott Kley Contini. Contini is Assistant Director of Instructional Technology - Pedagogy and Integration Coach, The Harker School. In his session Ready, Set, Screencast! Contini presented Harker School teacher screencasts that describe their summer professional development activities. The screencasts are part of the requirement for teachers who get stipends for summer professional development. They are presented at faculty meetings at the beginning of the year. Faculty may also view them later from a YouTube playlist. The screencasts help them learn new ideas and get excited about integrating new learning technologies. Having teachers present their work for their colleagues is an effective professional development activity for everyone involved. Of course San Domenico teachers wouldn't be able to attend a conference without presenting at a session or two. Here is a Dr. Doris Brown doing a "CUETip" presentation on how she uses the student response app Socrative. This June San Domenico School hosts iTeach 2014. Join our teachers and special invited guests for a fun filled schedule of interactive workshops, panels, and keynote presentations. There will be something for everyone. We look forward to learning with you this summer.